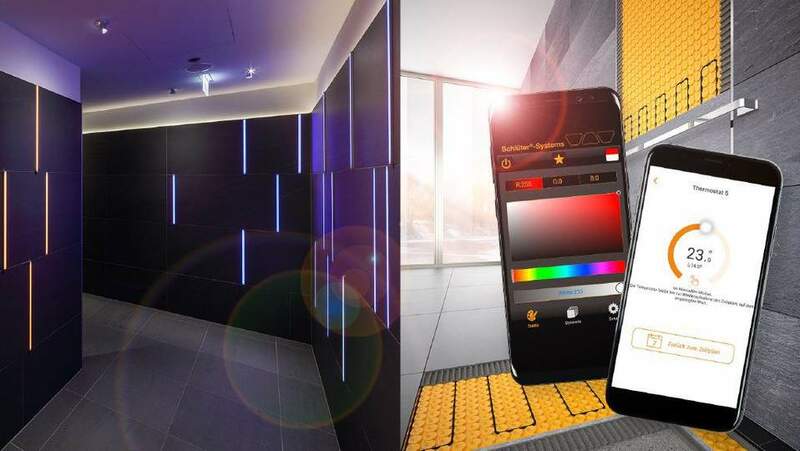 With the apps Schlüter-LED-Color-Control and Schlüter-HEAT-CONTROL, you can conveniently manage the LED illumination of Schlüter-LIPROTEC and the electrical heating system Schlüter-DITRA-HEAT-E with your smartphone or tablet. Schlüter-LIPROTEC makes light installation super easy. And now, thanks to the new Schlüter-LED-Color-Control app, you can also control your lighting in style. Light profiles that are equipped with LED strips of the LT ES 8 series can display over 16.7 million colours – with easy remote control of these light strips from any location. That's made possible by the Schlüter-LED-Color-Control app, which allows for setting and selecting up to 16 favourite colour scences via quick access. In addition, 42 different colour sequences are preprogrammed and can be played at variable speeds. The LED strips are controlled via Bluetooth. The Schlüter-LIPROTEC-EBR receiver was specifically developed for this purpose and can be fitted into small spaces. The Bluetooth app is available free of charge for Android and iOS devices. The electrical heating system Schlüter-DITRA-HEAT-E offers the option to create specific heated areas in floors and walls, combined with the benefits of the uncoupling mat Schlüter-DITRA-HEAT. The thermostat DITRA-HEAT-E-R-WIFI offers a choice for switching the heating system on and off or setting temperature levels: you can either directly control your heating system via touchscreen or dynamically choose your preferred settings in the Schlüter-HEAT-CONTROL app. No matter how you want to set up your Schlüter-DITRA-HEAT-E heating system – the Schlüter-HEAT-CONTROL app can be accessed via wireless or mobile phone networks to give you maximum flexibility. With Schlüter-HEAT-CONTROL, you can simply control your heating system from anywhere. Schlüter-HEAT-CONTROL is a free app for use with the thermostat DITRA-HEAT-E-R-WIFI. Save energy by only heating your home when necessary. Find your living space pleasantly preheated whenever you come home. Flexibly adjust your heating schedule from anywhere. Schlüter-LIPROTEC is an easily installed LED system. Whether in private homes or commercial properties – the illuminated profile technology looks good everywhere and can be quickly installed thanks to many pre-configured sets comprising profiles, LED strips and assembly accessories. 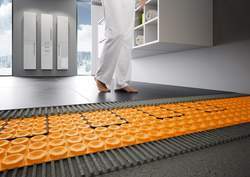 Schlüter-DITRA-HEAT-E is an electrical heating system for floors and walls. As a true all-rounder, the innovative concept pleases designers, developers and installers alike. Together, the mat and heating wires are only 5.5 mm thick, meaning they can be installed in places where other systems simply don't fit. Download the Schlüter apps for iPad and iPhone now. Download the Schlüter apps for your Android device.